The Sonos dashboard widget gives you quick basic control over your Sonos music system. It is not designed to be a full replacement for the Sonos app, but rather a quick and convenient way to play and pause music without ever leaving your Invisible: Controller command center. Before you can begin using the Sonos widget, it must be configured to control a specific Sonos device (or device group). Until it is configured, the widget will show "Sonos Not Detected." For details on configuring the widget, see the next section. When the widget is configured, it allows you to quickly and easily Play, Pause and Skip to the Next track for the configured player. When you push Play, the Sonos device will begin playing whatever was last configured in its playback queue (such as a Pandora radio station or custom Sonos playlist). To change the playback queue, or to change Sonos player groups, you still need to use the Sonos app at this time. You can quickly access the app (assuming it is installed on the device running Invisible: Controller) by tapping the "Sonos" title at the top of the widget. This will automatically attempt to open the Sonos app. To configure the Sonos widget, navigate to the "Settings" view in Invisible: Controller, and once there, tap on the "Sonos" settings option under the "Plugin Settings" header. The Sonos settings will now attempt to scan the local Sonos network and get a list of all available Sonos players and playback groups. Grouped devices will be presented as a single option, and "hidden" devices (like the Sonos SUB) will not be listed. Tap on the row that contains the Sonos device or playback group that you want the Sonos dashboard widget to control. When you're finished, tap "Done" to close the settings window. When you return to the Dashboard, the Sonos widget will now control playback for the configured device. If playback is already in progress, the widget should automatically display the current track information, album art and track position. Currently, the Sonos widget will cut-off the titles of longer tracks and albums. A future update will add automatic scrolling to longer titles so all track details can be clearly seen. 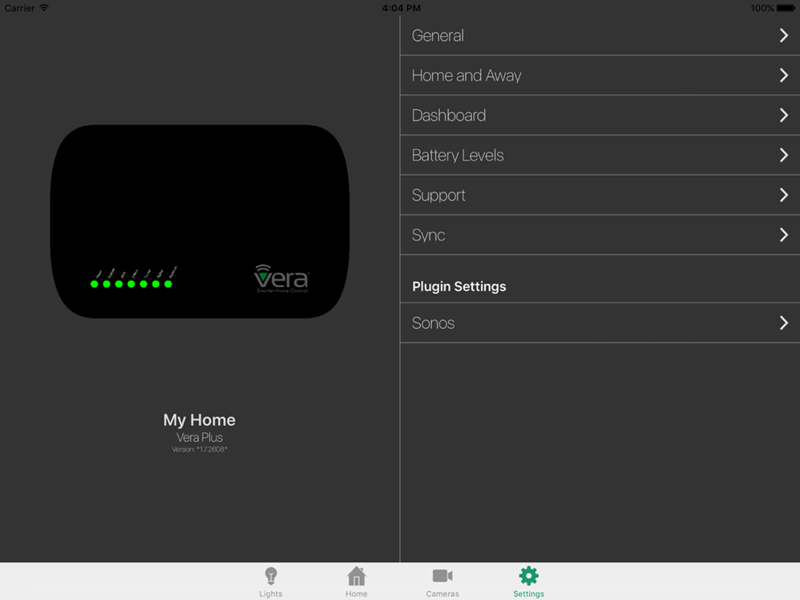 Sonos must be integrated with the Vera controller for player discovery to work. The IP address for a Sonos player will be read from the Vera hub configuration, and from there Invisible: Controller will use the Sonos API to discover all other Sonos devices. A future update will enable network discovery of Sonos devices even if they are not integrated with the Vera hub.